Travel the heart of the North Island exploring Auckland City, Rotorua, the Art Deco City of Napier and onto Wellington before crossing to the South Island. 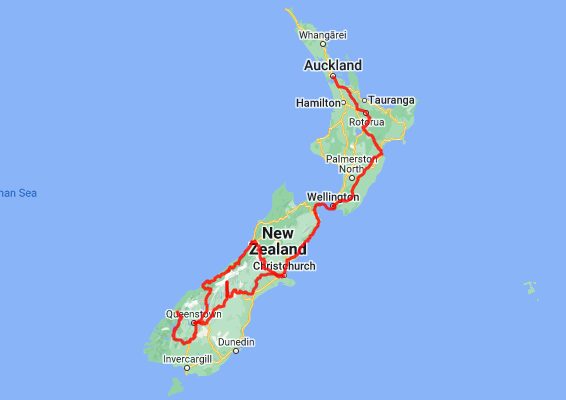 Continue down the east coast through Marlborough, Kaikoura and Christchurch before crossing the plains and into the Southern Alps and Mt. Cook. The alpine resort of Queenstown is next before heading north through Wanaka and onto the West Coast Glaciers. Return to Christchurch via the Tranz Alpine train. On arrival you will be met by one of our team and driven to your Auckland accommodation. Auckland, New Zealand’s self-proclaimed ‘City of Sails’ is the country’s largest metro area. Resting between the Pacific Ocean and the Tasman Sea, this urban paradise has something for everyone. Surrounded by native bush, rainforests and an abundance of beaches, Auckland is a playground for both the city savvy and those with an eye for adventure. Explore the central museums and galleries on foot, or take a drive through one of over 800 regional National Parks to see deserted beaches, waterfalls and native forest. Today Cruise the sparkling waters of Aucklands Waitemata Harbour. You'll learn about the most well-known city landmarks, including a stopover on dormant volcano Rangitoto. You'll see spectacular views of the Harbour Bridge, the city skyline and Devonport's historic naval base as well as enjoying the Bean Rock Lighthouse with a complimentary hot drink and sandwich. This small hotel bed & breakfast is located in the heart of Auckland's Ponsonby district. A two minute stroll to the vibrant cafes bistros, restaurants, art and craft galleries and just five minutes by car to the harbourside and central Auckland. This spectacular AJ Hackett walking tour is the only bridge climb in New Zealand - and the ultimate way to experience the iconic Auckland Harbour Bridge. All walkways are custom engineered and gentle sloping archways mean this activity is suitable for all ages. As you're guided to the top you'll be greeted with a 360 degree, panoramic view of the sparkling Waitemata harbour. See the best of the city from above and learn all about the secrets of the bridge! Today you'll be leaving the city and heading northwest to Kumeu Wine Country, Auckland's Heritage Wine Region. Enjoy lunch at a contemporary vineyard, sample world-renowned wines and marvel at the rugged surf-fringed coastline nearby. Your first stop is award-winning Soljans Estate Winery. Utilising both traditional and modern techniques, Soljans produce varied and richly flavoured wines. Built with sunshine in mind and a distinct Mediterranean-style, the onsite restaurant showcases fresh seasonal produce from around the region. Continuing on, you'll visit the Muriwai Gannet Colony - one of the few mainland nesting sites in the world. Situated on the cliffs overlooking the Tasman sea you'll have breathtaking views of the beach and ocean beyond. Your final tasting is at West Brook Winery, one of New Zealand's oldest. These wines reflect true varietal character and their unique regional origins. The drive south from Auckland takes you past the Bombay Hills and into the rolling farmland and rich dairy pastures of the Waikato. The Bombay Hills mark the outer boundary of greater Auckland area and it's here you turn inland to central Waikato. You’ll soon go through the town of Matamata where you can visit the fully intact Hobbiton film set used in the shooting of the Lord of The Rings and Hobbit trilogies. Continuing on, you’ll pass several small farming communities before telltale signs of steam and other geothermal activity signal your arrival into Rotorua. The Springs is set in a simple yet elegant garden of roses and camellias evoking a sense of restful contentment. The Guest Wing, with four elegant rooms, is at the rear of the house ensuring a private, quiet stay. An evening at Mitai will give you an awe-inspiring introduction to the indigenous Maori culture. Marvel at the beautiful bush setting and see warriors in traditional dress who paddle an ancient warrior canoe (waka) down the Wai-o-whiro stream while trout and eels swim beneath the surface. Enjoy a traditionally cooked hangi meal and round your evening off with a spectacular cultural performance that tells the story of the Maori people, their past, carvings, and ta Moko -Tattoo art. Be captivated by the displays of weaponry and combat and be amazed by the spine tingling Haka finale. Truly an experience to remember. This drive will take you through the thermal region just south of Rotorua. Home to a plethora of unique geothermal attractions including boiling mud pits, natural hot springs and steaming geysers, this area is a must do before you move on to Napier. Notable attractions are Wai-O-Tapu, Waimangu and Craters of the Moon. Continue on to Taupo and marvel at the lake - a giant crater formed following a volcanic eruption in the year 180 CE. As you approach the city, be sure to stop at Huka Falls to view the spectacular sight of hundreds of cubic metres of water spilling every second down the narrow 11 metre drop. For an extra thrill take a jet-boat ride to the base of the falls. Leaving Taupo, follow the road as it climbs the rugged Ahimanawa Range before descending back down the Pacific Coast to art deco Napier. This beautifully restored, single storey 1890's residence is nestled in a quiet cul de sac on Napier Hill, a great location from which to explore the Art Deco city. A 5 star boutique Bed & Breakfast experience with unparalleled facilities and luxurious rooms. With is mediterranean climate and Art Deco style, Hawke's Bay is an attractive holiday prospect. As the nation's first winemaking region, a visit to one of its 30 wineries is a must. A trip to Mission Estate, touted as the the birthplace of NZ wine, can't be missed. For the truly enthused, head out on a tour of the vines. We recommend the to make the most of what's on offer. Those into Gatsby will enjoy the chance to view prominent Art Deco landmarks on a 1930s Vintage Car Tour. Passengers will spend just over an hour learning about the history of the city's architecture - including the Napier Municipal Theatre, one of the top ten Art Deco Buildings in the world. If you're after some fresh air, hire a bike and take your pick of one of over 200km of cycling trails or head on down to one of the many beaches that ring the area. Ocean or Waimarama beach are good choices, and both are patrolled by surf lifeguards during the summer. Indulge in some local produce and head out on a cheese, chocolate, honey or orchard tour. End on a high with another ride, this time in comfortable trailer pulled by a tractor en-route to Cape Kidnappers Gannet Colony - the largest of its kind in the world. Napier, the city by the sea, is renowned for its 1930s Art Deco architecture, events such as the Art Deco Weekend in February, stately Norfolk pines, surrounding wineries and local fresh produce. Supported by a Mediterranean climate and over 2,200 hours of sunshine a year this popular year-round destination boasts a vibrant cafe culture amongst the splendour of the Art Deco buildings. Around 30 cafes are within walking distance of the central city area, while Ahuriri, just over Bluff Hill, is home to a further cluster of up market establishments. Marine Parade overlooks the Pacific Ocean and out towards Cape Kidnappers, home to the world's largest mainland gannet colony. A full day can be taken visiting Ocean Spa hot pools and swimming complex, the Hawke's Bay Museum and the National Aquarium of New Zealand. A landmark of Napier is Bluff Hill, which is home for many Napier residents and provides views of the town, beaches of Perfume Point and Westshore and out towards Whirinaki. Bluff Hill also overlooks the Port of Napier, one of New Zealand's busiest ports, transporting timber, local fruit and meat products to worldwide destinations. In 1931, New Zealand's greatest natural disaster struck Hawke's Bay. At 10.47am on Tuesday February 3rd, an earthquake of magnitude Richter 7.8 struck. In a minute and a half, in two separate shocks, the centre of Napier was almost totally destroyed. Fires quickly broke out and reduced to ashes or gutted what the tremors had left standing. Damage in Hastings was also devastating, although the fires were contained. Wairoa and the smaller towns to the south as far as Dannevirke were affected. There were 258 deaths - 162 in Napier, 93 in Hastings and 3 in Wairoa along with many injuries. The reconstruction of Napier and Hastings were costly but the benefit was two modern cities and the Ahuriri Lagoon, or Inner Harbour as it was usually known, was raised over 2 metres, creating the land, which Napier desperately needed to expand. On this unique eco-adventure you will get to experience one of the largest and most accessible mainland gannet colonies in the world. You'll be pulled on a trailer from the back of a vintage tractor along the beach to the Black Reef Colony - where you'll have the chance to see the birds in their natural habitat. Depending on the season, visitors can witness new-born chicks through to four month old gannets preparing for their first ever flight, which will take them all the way to Australia. Continuing on to the Cape, you'll take a break which gives you the chance to picnic, swim or enjoy a scenic walk to the Plateau Colony. Take a scenic drive through the vineyards as you learn about the region and its wines. Enjoy a full interactive wine tasting alongside gourmet platters at Vidal. Take in the breathtaking panoramic views from Te Mata Peak while enjoying a glass of bubbles as the sun sets from 399m above sea level (overlooking the glimmering lights of the Twin Cities in winter). The rolling countryside of the Hawke's Bay leads you into some of New Zealand’s richest farmland, located around the Manawatu region. Passing along the Manawatu Gorge the Wairarapa welcomes you. Masterton is home to the golden shears sheep shearing competition while just further south Greytown boasts the largest concentration of historic wooden buildings in the country. Nearby Martinborough is home to dozens of boutique wineries. The route takes you over the Rimutaka Range and along the magnificent natural harbour that the capital city of Wellington sits upon. The Bolton Hotel is a contemporary apartment hotel in the heart of Wellington's CBD. This hotel has 142 guest rooms and suites are furnished in a contemporary style and feature Sky Digital television, movies on demand, high-speed Internet (including WiFi), a personal bar, and air-conditioning. Enjoy an intimate small group tour looking at the unique aspects of the World's Coolest Little Capital. Drive through Courtenay Place and Oriental Parade and head up Mt Victoria for spectacular views of the City and Harbour. Then travel the stunning rugged coastline, now a marine reserve, stopping along the way to taste some famous Wellington coffee. Return to the central city for a drive through the quirky Cuba Street district and along Lambton Quay, the main shopping street for a chance to ride the famous Wellington Cable Car. 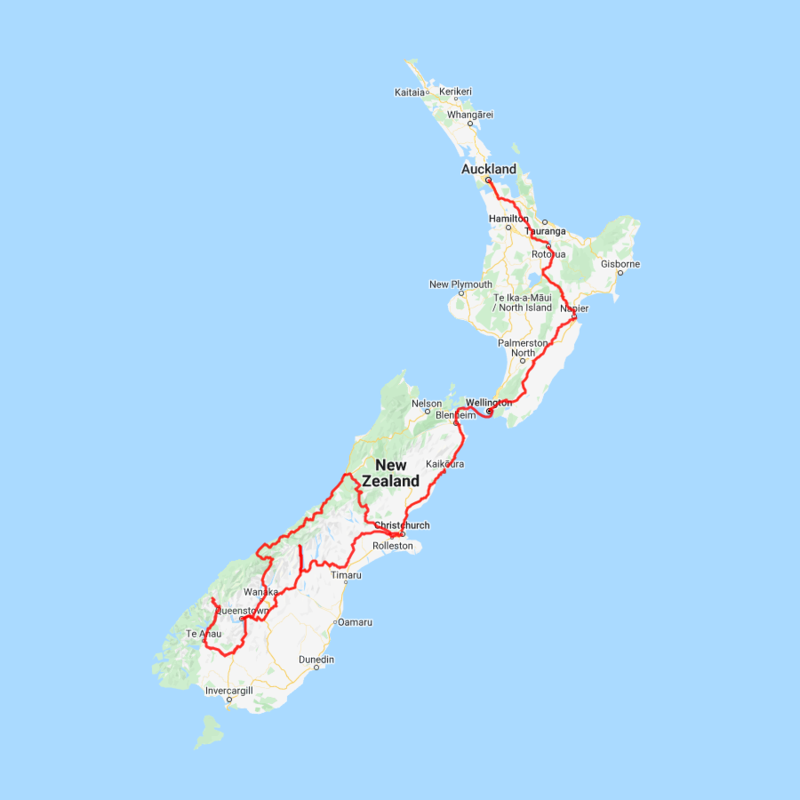 The 92 km journey between Wellington and Picton takes around 3 hours and has been described as 'one of the most beautiful ferry rides in the world'. Leaving Wellington Harbour you pass many interesting points such as Pencarrow Head on top of which is New Zealand's oldest lighthouse (1859). Red Rocks is home to a seal colony and Oterangi Bay is the site which recorded the country's highest ever wind speed of 268 kph (167 mph). From the Cook Strait spectacular views of the Kaikoura Ranges on the South Island can be enjoyed and dolphins and many sea birds are often seen. Around one hour of the cruise takes you through the Marlborough Sounds and this region of bush covered mountains, small islands, crystal clear waters and secluded bays offer remarkable photographic opportunities. The final leg of your cruise travels through Queen Charlotte Sound before coming to an end in the picturesque town of Picton. Only short 30 minute drive, you’ll follow the valley south to arrive in Blenheim, located in the heart of Marlborough - New Zealand’s largest wine producing region. Go through acres of leafy green vines and marvel at the magnificent ‘dry hills’ of Marlborough in the distance. An afternoon among the vines! Be immersed in the Marlborough wine country with the Sounds Connection half day wine tour. You'll be collected from your accommodation and taken through three or four hand-picked wineries to taste the award-winning produce this region is known for. You'll also hear about the history of winemaking in Marlborough as well as learning the unique processes each winery goes through. A lunch stop is not included in this tour so we do advise you have something to eat prior to this activity. The Peppertree is situated in the midst of an extensive country garden a boutique vineyard and an olive grove. Choose from one of the five spacious suites, each of which reflects a different character. Days at The Peppertree begin with a delicious breakfast, served in the Dining Room or on the verandah. Cross the 'dry hills' of Marlborough and head towards one of the most spectacular coastlines of the South Island, the Kaikoura Coast. The road hugs the shore for around 50 kilometres and offers many chances to view native wildlife. To the east is the South Pacific Ocean and to the west the towering Kaikoura Ranges. Kaikoura Township is a bustling little place with many cafes, restaurants and shops - but the main reason for visiting here is the wildlife - and it's one of the only places in New Zealand you can see whales year round. Hapuku Lodge was built to give guests a great night's sleep in one the most beautiful places in the world. The Lodge sits tight between the mountains and the ocean, on a deer stud and olive farm. Today you continue down the coast before heading inland through the North Canterbury wine region - the Waipara Valley. As you drive through this area you’ll be greeted by one of New Zealand's most notorious animals, the sheep. If you’ve time on your hands we recommend taking a detour to Hanmer Springs for relaxing dip in its thermal pools. Arriving into Christchurch you'll see a new and improved city, steadily rising from the ruins of the 2011 earthquake. Orari Bed and Breakfast offers elegant and inviting accommodation in the heart of Christchurch city. This heritage building has all the charm of a grand Victorian home, but with modern comforts providing for an enjoyable stay. In the Heathcote Valley, just fifteen minutes from the heart of Christchurch city, ride the Christchurch Gondola for nearly a kilometre to the collapsed rim of an extinct volcano - which exploded six million years ago. Take in the panoramic 360-degree views of the central city, Lyttelton Harbour, Banks Peninsula, Canterbury Plains and the distant peaks of the Southern Alps. Wander the summit complex and choose one of many nature walks or visit the Time Tunnel - a dramatic reconstruction of the history of the Port Hills and Christchurch. Drive through the heart of the South Island today, crossing the vast Canterbury plains. Stop for a breather in Geraldine before continuing into Mackenzie Country. As you head over Burkes pass you'll come to the picturesque lakeside town of Tekapo. Follow the road and take in the view of Aoraki Mt Cook (New Zealand's tallest mountain) from the shores of Lake Pukaki, renowned for its incredible turquoise hue. Skirt the lake edge to arrive at your final destination Mt Cook Village. Experience 500 year old icebergs up-close on the Mt Cook terminal lake. The Glacier Explorers tour is the only one of its kind in New Zealand - and one of only three in the world! Very few glaciers terminate into lakes and even fewer of them are accessible. See towering ice cliffs and floating icebergs from the safety of a specially designed boat. These boats provide a safe way to view unseen and inaccessible areas of New Zealand's largest glacier - The Tasman. The Hermitage Hotel ringed by magnificent snow-capped peaks of the Southern Alps, is a world-renowned tourist destination and has been an icon of superior accommodation and dining since 1884. Today you'll leave Mount Cook National park and travel to Queenstown. Go through the lakeside town of Twizel and then pass through the gliding capital of New Zealand - Omarama - before ascending the Lindis Pass. Follow the road to Cromwell, located at the at the head of the Kawarau Gorge. Continue on towards the Gibbston Valley, one of New Zealand's premier wine growing regions. See the historic Kawarau Bridge where you can bungy jump, or relax and watch others take the plunge. Approaching Queenstown, the Remarkables mountain range comes into view as you arrive into the adventure capital of New Zealand. The Dairy is a small private luxury hotel providing exquisite bed and breakfast accommodation. Just 1 minutes walk from Queenstown Centre it also features a large lounge and open fire, outdoor spa and a bar. Westwood is a purpose built lodge, crafted entirely from wood and exquisitely decorated throughout. The lounge is the place to meet to watch the Southern Alps turn a soft pink in the setting sun. Take a spectacular scenic flight over two of New Zealand's most famous glaciers. Land at the head of one and view the incredible sight of this frozen river as it winds its way through ancient carved valleys. Should weather not be suitable to take this flight you are able to transfer your booking onto a similar tour on any of the Helicopter Line's operations in Queenstown or Mt Cook. Your private transfer will collect you from your accommodation and transfer you to Christchurch Airport in time for your departing flight.